This week’s #MarkerMonday discusses Alice Harrell Strickland, the first female mayor in Georgia, and the struggle for suffrage in the state. Alice Harrell Strickland was born in 1859 to a family of pioneers in Forsyth County. She married Henry Strickland and moved to the City of Duluth where the couple built a house and raised 7 children before Henry’s death in 1917. In 1919, Alice traveled to Atlanta to join suffragists gathered to address the Georgia General Assembly. After the United States Congress passed the Nineteenth Amendment on June 4, 1919, which granted women the right to vote, they submitted it to the states for ratification. On July 7, 1919, suffragettes and anti-suffragists spoke to the Georgia General Assembly as they debated a resolution to reject the Susan B. Anthony amendment. Among them was Alice Strickland, who represented herself as a country suffragist, and dismissed the notion that only city girls wanted to vote. However, suffragists’ solicitations not to reject the amendment failed—largely because anti-suffragist women and men viewed enfranchisement as a threat to traditional gender and societal roles—and Georgia became the first state to reject ratification of the Susan B. Anthony amendment. Over a year later, after Tennessee ratified the amendment on August 18, 1920, the Nineteenth Amendment achieved the needed support of three-fourths of the states. Although most states waived similar barriers for the new voters in the presidential election in 1920, Georgia barred women from voting by citing a law requiring voters to be registered 6 months before an election. Mississippi was the only other state to do so. It was not until August 13, 1921, that the Georgia General Assembly passed an act allowing “Females to Vote and Hold Office,” which in the 1922 elections enabled women to vote statewide for the first time. 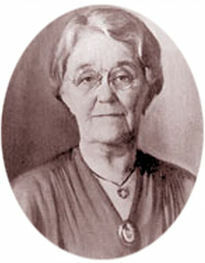 Under the new federal amendment and state law, Alice Strickland was elected by Duluth to serve as Georgia’s first female mayor from 1922-23. Acts and Resolutions of the General Assembly of the State of Georgia. Explore the links below to learn more about Alice Harrell Strickland and women’s suffrage in Georgia. GHS houses several collections related to women’s suffrage in Georgia. Rev. Canon C.E.B. Harnsberger collection of Berrien family papers, 1855-1962. National Association Opposed to Woman Suffrage broadsides, 1917-1919. The Georgia Historical Quarterly published articles related to Alice Strickland and women’s suffrage in Georgia which can be accessed on JSTOR. If your library does not have access to JSTOR, you can go to www.jstor.org and create a free MyJSTOR Account.